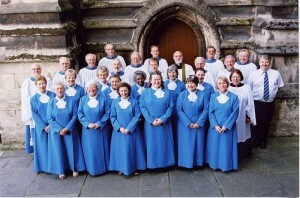 St. Mary’s is fortunate to have the support of a large and enthusiastic adult choir, which is responsible for the musical ministry of the church both within and beyond the parish. Numbering up to 30 at full strength, the choir rehearses on Friday evenings at 7.30pm, and again immediately before every sung service. The repertoire is comprehensive, ranging from the the music of the Renaissance schools right up to works which have been specially written for the choir. Although the choir works hard, it also plays hard – we have many annual excuses to get together socially, either for suppers, parties, or even fireworks displays! Beyond the parish, St. Mary’s choir is regularly on the road, taking music into country churches who have no such resources of their own. We support our local Churches Together events, and sing annually at the City Blitz Victims commemoration on Armistice Day. In addition to the occasional cathedral evensong, we travel abroad from time to time, having so far sung in the Czech Republic (Prague and Hodonin), Germany (two trips including Berlin and singing at the graves of J S Bach and Martin Luther), and Portugal, where we gave several performances, including at the shrine at Fatima. We have also performed on several occasion in the more secular surroundings of the Stourhead Estate. New voices are always welcome, please contact us if you are interested in joining.